Saint Bernard's famous work, The Steps of Humility and Pride (in Latin, De gradibus humilitatis et superbiae), is a short book consisting of a mere fifty-seven paragraphs. In it, the Abbot of Clairvaux unpacks the doctrine of the very crucial chapter 7 of Saint Benedict's sixth-century Rule for Monks, which explores the dynamic "steps" or "degrees" of both humility and pride. This chapter by Benedict could well be considered the spiritual basis of all Benedictine existence. 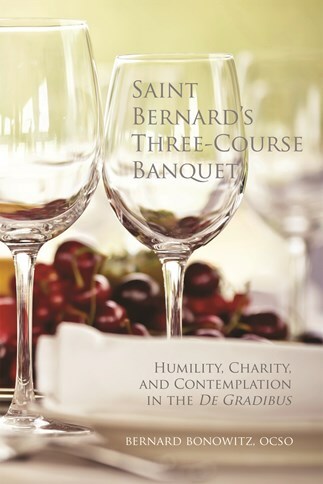 In Saint Bernard's Three-Course Banquet, Dom Bernard Bonowitz makes the teaching of both Bernard and Benedict accessible to modern readers in a set of conferences originally conceived for and delivered to a group of Cistercian "juniors," that is, monks and nuns who had completed their novitiate but had not yet made their solemn vows. With Dom Bernard as a guide, many more readers can be sure of drinking at the purest sources of the monastic tradition, which at that depth becomes one with the Gospel itself. A convert from Judaism with a degree in Classics from Columbia University, Bernard Bonowitz was a Jesuit for nine years before entering St. Joseph's Abbey in Spencer, Massachusetts. Immediately upon professing vows, his abbot named him master of novices, a position he held for ten years and that gave him ample opportunity to share considerable gifts of mind and heart while initiating newcomers into monastic life, at the levels of both classroom teaching and spiritual direction. In 1996 he was elected superior of the monastery of Novo Mundo in Brazil, which he soon shepherded into a true monastic springtime. In 2008, he became abbot of Novo Mundo, now a community attracting an impressive number of young men anxious to follow the way of Cistercian discipleship. "The wisdom of St. Bernard has found an outstanding new voice in the meditations contained in this book. The author's wonderfully personal style transforms the reader from a mere listener to an active participant in a grace-filled dialogue. The experience of monastic life appears here in all of its beauty, simplicity, and truth." "Dom Bernard offers an analysis so clear and compelling that this book will become a spiritual `source book' for all who read it. There is a depth of personal experience and conviction in the book that is captivating. With sweeping references to literature, philosophy, and theology, Dom Bernard demonstrates a breadth and depth of appreciation for the spirituality of Bernard of Clairvaux that balances scholarship with spiritual direction." "This book has much to recommend it, especially as a reliable interpretation of the Saint's teaching. In a particular way, it will help us to discover how the doctrine of the Abbot of Clairvaux is present and active in our own monastic life as we live it in the here and now. The examples taken from the author's personal experience give a special zest to the solid teaching the book contains, all of which contributes to the depth and relevance of its message and the attractiveness of its general style." "Long ago St. Francis espoused Lady Poverty and in our own time Bernard Bonowitz, OCSO, has taken to himself Lady Truth. The happy fruit of this union is a commentary that conveys St. Bernard's meaning in a way that brings us in touch with the original depth, incisiveness and humor of this great work. We are deeply indebted to Bernard Bonowitz for making this possible by his own honesty, humor and depth."